I often have trouble describing the kind of fiction that I like to read. This makes it difficult for me to find novels that I am not going to give up on after 20 pages. I find myself typing combinations of words in to Amazon, growing more desperate as I’m met with increasingly poor results. Is “art history fiction” a thing? Or “science history fiction”? Or “academic fiction” maybe? After flailing a bit, I tend to give up and buy a non-fiction book. Surely others out there want to read this kind of book; I mean some books in this unnamed genre get big time awards. Why doesn’t someone gather them all in one place under a particular subheading? 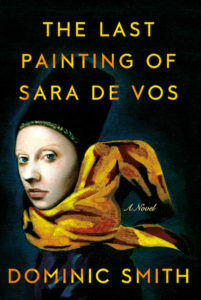 I’ll tell you something, The Last Painting of Sara de Vos by Dominic Smith is exactly the kind of novel that I want to read. I just devoured it over the course of the past 24 hours and now I’m sad it’s finished. Back to a few fruitless Amazon searches and the nonfiction inevitable. The Last Painting of Sara de Vos takes places in three locations and at three times: New York in the late 1950s, the Netherlands in the 1630s, and Sydney in 2000. It is a story of two women connected through two versions of the same painting: the original by a rare 17th century female Dutch artist and a forgery painted by an Australian art history graduate student. Both paint illicitly. Both face terrible consequences. Neither of them seem like criminals. It’s difficult to progress one story through three different points in the past, but Smith pulls it off. When a novel jumps between centuries, it can be jarring for the reader: as if the moment you’ve lost yourself in one world, you are forced to create another in your mind. Somehow, The Last Painting of Sara de Vos manages to keep everything together: the story strands weave like a braid, the 1630s tying back to the 1950s, anchored by 2000. It feels fine to move through time. The painting is the constant anyway. Furthermore, Smith’s writing has an academic edge: he has done enough homework that the art history in the book is believable. I can’t tell you how important that is. If you are a bookish sort yourself, you know how hard it is to relax into a novel that doesn’t get basic procedural or disciplinary things right. If I mutter “Urgh, that isn’t how museums/universities/auction houses/archaeological digs work”, the magic is gone and I can’t get it back; “non-fiction is my fate” I think. That did not happen here. Smith’s book has no potholes and, thus I raced on through. So yes, this is a novel about art crime. Two art crimes perhaps: the creation of a forgery to mask the theft of an original painting. The act itself is a minor blip in the book, rather the focus is on choices made by the painting’s forger and the painting’s owner and their consequences. The characters are interesting, complicated, and realistic. As an aside, the book features or at least mentions the following things which appear on my list of ongoing obsessions: the Dutch Golden Age, space dogs, whales, art forgery, art theft, female academics, absurd elite commodities. Way to tick my boxes. Chicago, 1897. An obsessive collector and insurance magnate commissions the world’s tallest building. Determined to compete with Marshall Field’s recent donation of $1 million to found the Field Museum, the tycoon funds a private ‘collecting’ voyage into the Pacific, collecting not only weaponry and artefacts but also ‘several natives related by blood’. I couldn’t press “buy” fast enough. But ultimately that book will finish and I will be left with a lazy Saturday shaped void that I can’t seem to fill with a much desired novel. Maybe I should email Dominic Smith and see what books he likes. We seem to be on the same page (*ho ho*). So if I were you…no, if YOU were ME you’d pick up The Last Painting of Sara de Vos, read it super fast, and then pout around all evening because it ended too quickly and you want more.